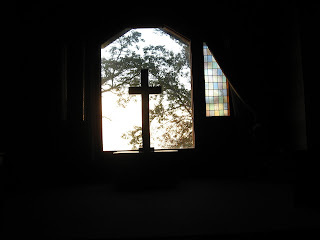 Last October I took this picture on Sunday morning in the chapel at Casowasco. We were there on Owasco Lake for a quilt retreat. It was a misty morning and the sun was just breaking thru. By now the new dining hall should be open and waiting for the hundreds of children who come there in the summer. We'll look forward to eating there in late October. This morning I pulled fabrics for a few donation blocks for both guilds. Triangle Guild would like a Zany Anne block in red, white and blue. Chenango Piecemakers asked for a Churn Dash using a child's novelty fabric as the center block. We make the blocks 12 1/2" unfinished size. As I pawed thru ten baskets of small pieces of fabric I found a selection of black and whites that might get used for a project immediately. And then there is that gorgeous fat quarter in dark gold with berries and leaves, just little green, burgundy and a splattering of gold. I see another octagon table topper for fall in my future. In the immediate future I see breakfast. What shall I fix. SweetOldBob likes a big breakfast. I'd be happy with a bowl of cereal with a banana sliced over it. Coffee cup is empty so guess I'd better go cook.